Of course you have seen these buildings in downtown Rock Island. You can easily find them. You don’t even need to look up their locations in early 1900s City Directories. You even realize they won’t look exactly the same today. Not only can you expect to see today’s new businesses, but the appearance of the first floor is almost certainly different. The recessed entries that maximized display area, the little free-standing kiosk in front, certainly signage, are likely changed. We, too, were confident that we’d have no problems finding this place by proceeding logically. First we looked for some clues. There’s the protruding oriel window on the building to the left. It surely has a twin on the other side, out of the picture. And the seven round topped windows on the center building can help identify it. Even if they have been bricked in or covered, their number and shape may still be visible. The single story restaurant may have been increased in height making it harder to identify. But we also know that buildings that house food establishments often remain used for similar businesses over decades, so that can help our search. We are quite sure we can find them quickly because they look so familiar. These buildings are located in the 300 block of 18th Street. Or they are on the south side of the 1800 block of Second Avenue – after all, we can even remember Gustafson’s shop being there. Then again, maybe they are on the north – or south – side of the 1700 block of Second Avenue — or of Third Avenue. We went looking, but we didn’t recognize anything. So we had to go back and check the city directories, where we found that one of our guesses was correct. Our postcard shows the south side of Second Avenue east of 17th Street. The building on the far left is still there, operating as the Thirsty Beaver nightclub in 2003. Although the oriel windows are long gone, replaced by flush windows, their position in the façade is obvious. The other windows still have the same configuration – two sashes with a transom atop. This was built in 1892 for the Krell and Math, who operated a bakery, confectionery, and ice cream shop. Many remember it as the home of Woolworth’s, which moved there in the late teens from their earlier store, located where Putnam’s 5 & 10¢ store is shown on the postcard. The focal point of our postcard is the center building at 1714-16 Second Avenue. Here, the round-topped windows and the restrained but intricate brickwork in the cornice point to a construction date in the 1870s. The beautiful gold leafed sign extending across the front as well as the painted upper windows proclaiming “Lawyer” and “Justice of the Peace” were typical of the time. Although the gold leaf is a nice touch, the overall signage can only be described as cluttered. Is this building still here today? We aren’t sure – at least it is not recognizable. In the 1920s it was either replaced or totally remodeled. Although no longer the ornate building shown on the postcard, its appearance today still resembles that of the 1920s. 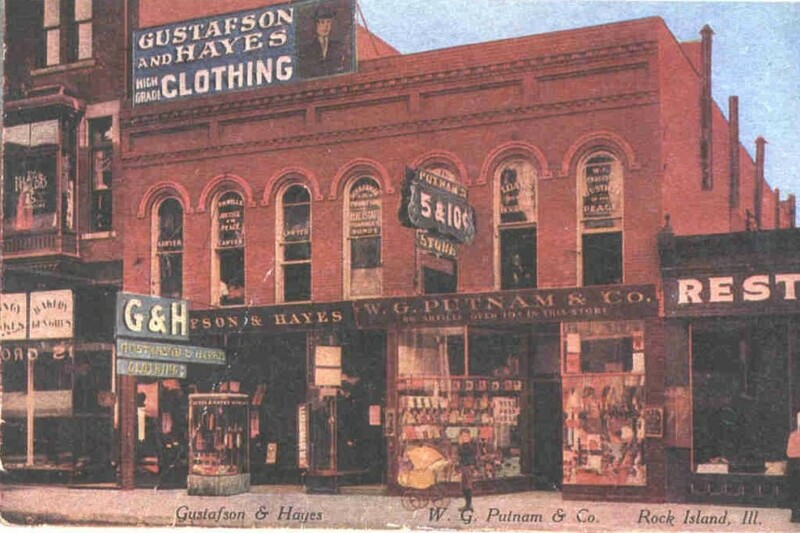 Even before the reconstruction, John Gustafson had opened his own clothing store at 1721 Second Avenue, while the Hayes business remained here. In the early 1930s, Newberry’s Department Store took over the building and remained into the 1970s. Quad-City Arts was a tenant for a few years, then Chantilly Lace nightclub and later the Funny Bone comedy club. The small restaurant to the right was demolished and replaced in the early 1920s with the much more elegant, three-story Mosenfelder Building that is faced in embossed white tiles. Although the street level façade has been drastically altered, the upper stories are still beautiful. It has been home to Le Figaro restaurant for many years. Why does this scene seem so familiar today, even though it hasn’t been here since the 1920s? Because these buildings simply look like they belong. Because there are still downtown buildings with similar architectural details. And because we appreciate the remaining ones even more when we realize how many have disappeared. Finally we urge you to visit this scene as it appears today. There are still three very nice – albeit different from our postcard – buildings that are worthy of preservation. This article, by Diane Oestreich, is slightly modified from the original which appeared in the Rock Island Argus and Moline Dispatch on May 4, 2003.